Today’s post is Chapter 5 in our series re-printing Frank Brooks’ “Travelling by Trolley in Mississippi: Stories about Streetcars.” View other posts in the series at the “Streetcars” tab. JACKSON. A car stopped in front of the governor's mansion on Capitol Street. 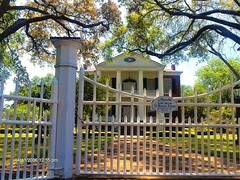 The Old Capitol is in the distance. It has been a good many years since I have been in downtown Jackson but I remember how old streetcar tracks used to be visible in the pavement where Capitol Street ended at State Street. There were also tracks to be seen in a street alongside the Illinois Central passenger station. All remnants of trolley transportation may well be gone by now, but Jackson boasted travel by streetcar railway for 64 years. 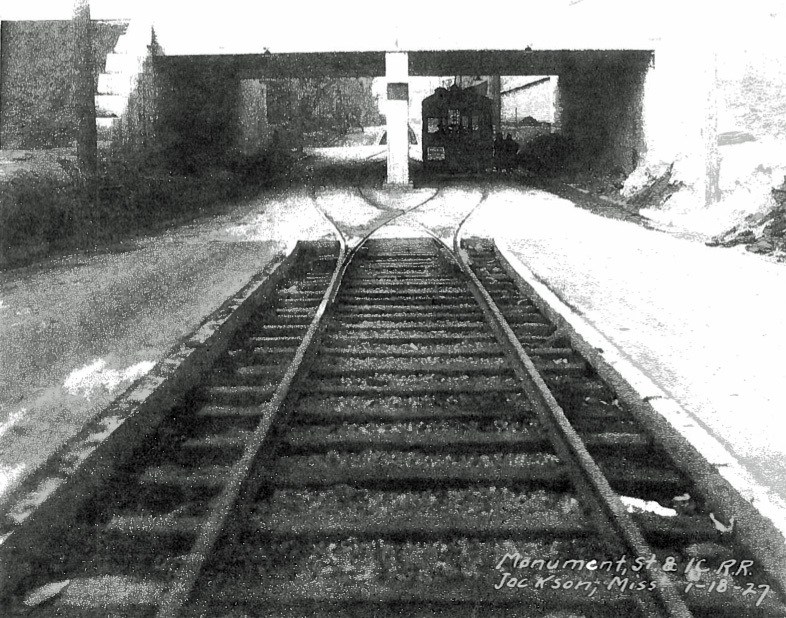 The first tracks appears in Jackson streets in 1871 with the inauguration of mule-drawn cars. Those cars followed a route from the railroad station to the old capitol, thence up State Street to Fortification Street. Another line traveled northerly on West Street to the area of Millsaps College. In a recent book entitled Jackson, the Way We Were, Carl McIntire wrote a delightful story about Norris Morgan, a driver of one of Jackson’s mule cars, who did shopping for some of the housewives along his line. As he passed their houses going downtown, he would get their orders and then make the purchases upon arrival at the stores. He then made the individual deliveries on his next outbound trip! The laides appreciated his services so much that they presented him a gold watch in 1899–the year that marked the end of the mule-drawn cars and the beginning of the electric trolleys. James H. Bowman and R.O. Stevens first tried to build a street railway in 1863. Presumably, the ravages of the War Between the States, then in progress, blocked their efforts. The next attempt came in 1867 when the legislature granted to Joshua Hull the right to organize the Jackson City Railway Company, but he failed to do so. Another charter was granted and service began on October 19, 1871, when the mule cars made their maiden runs. After electrification of the lines, there were extensive expansions of the system’s facilities. There were also multiple companies operating within the city at the turn of the century. 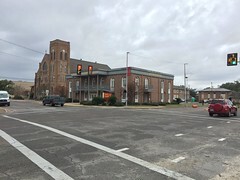 However, by 1914, there were only two major utility companies in Jackson: the Capitol Light and Power Company and the Jackson Light and Traction Company. The latter company finally assumed operations of all the gas, electric power and streetcar services in Jackson. 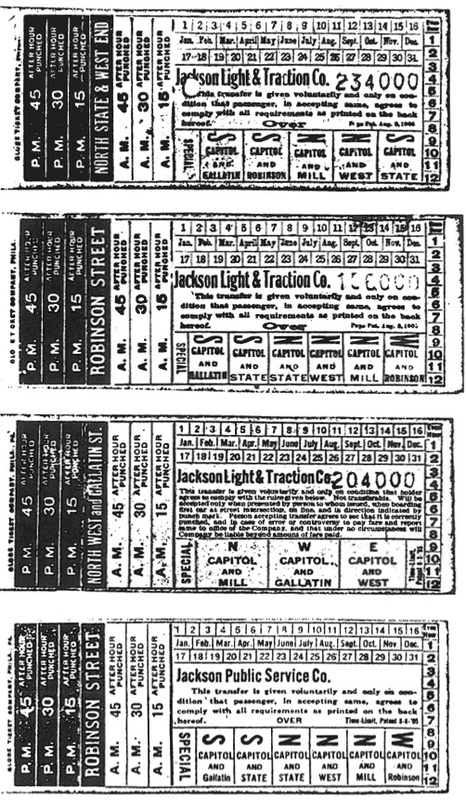 The Jackson Light and Traction Company was eventually taken over by the Mississippi Power and Light Company, which, in 1923, also bought the utility services operating in Columbus, Greenville and Vicksburg. JACKSON. Famous old trolley car "No. 3" - a handsomely furnished vehicle delivered to the capital city in 1905. 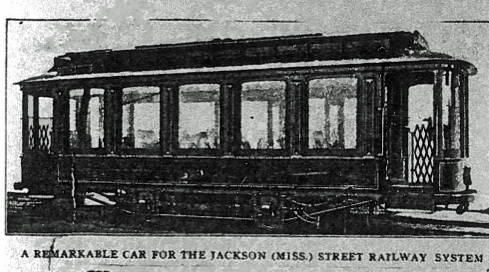 In the early years of this century, Jackson had a very special trolley car, “No. 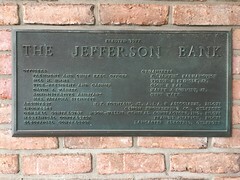 3,” delivered by the American Car Company in St. Louis to Jackson. A trade magazine, dated March 1905, described the car as being truly remarkable! The interior was richly finished in handsomely carved mahogany, and the ceiling was painted light green and decorated with gold. There were four elongated beveled mirrors on each side of the car and the windows were fitted with quarter inch polished French plate glass. Wire screens were placed behind the low, curved glass windows in the vestibules. 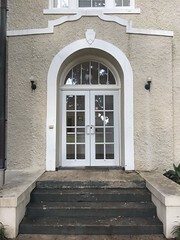 Among other furnishings were angle-iron bumpers, sand boxes, gates of Brill manufacture plus gongs and steps of the American Car Company’s type! I wish we knew for which purposes and occasions this car was normally used and something of its final disposition. 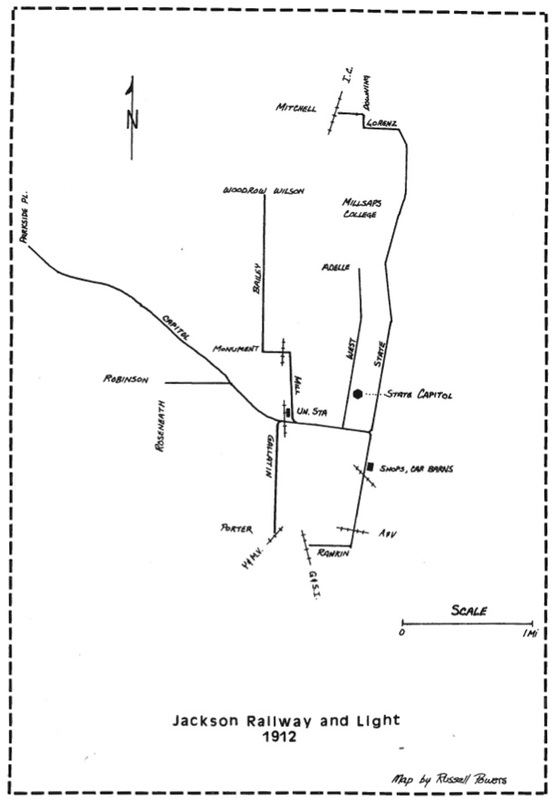 In 1916, the Jackson system operated 22 cars over 16 miles of track. However, by 1924, the system had shrunk to 20 cars and 13.5 miles of track. 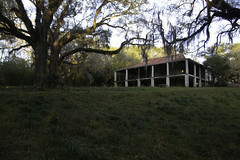 The power station and repair shops were at Tombigbee and Commerce Streets. Trolley service came to an end in Jackson on March, 24, 1935. As of that date the M.P.& L. Company sold its transit operations to the Jackson City Lines, a company which subsequently provided municipal bus transportation to all sections of the city. Streetcars without wheels were ordinary sights in central Mississippi towns when I was a growing boy. They were, nevertheless, in use. It seems like most of them housed short order diners, but I remember several which were used as shoe repair shops. I remember one such car in downtown Forest and I always wondered if it was a car which formerly clanged its way past the Governor’s Mansion on Jackson’s Capitol Street and then moaned its way along the fronts of the beautiful old homes on North State Street. I never knew. 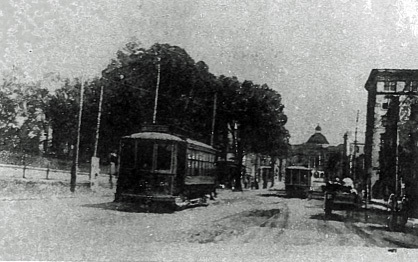 Given the positive quality-of-life impressions we have of the New Orleans streetcars – and their associated tree-lined boulevards – today, how short-sighted it seems we have been in following the lure of “progress” by removing them from the hearts of cities like Jackson. Now Memphis has re-instituted streetcars as a way to lure tourists back into its downtown/Beale Street area. With the renaissance of Capitol Street (and Farish Street), wouldn’t that be great for Jackson? Or even better, what if those passenger rail lines still fed in from outlying towns? 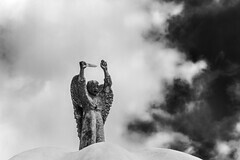 In the 1920s, my grandmother got on the eastbound train each morning at the Edwards Depot and rode to the base of Capiaol Street, where she walked up to her job at the phone company – then took the train back each afternoon. I do think it’s interesting how quickly almost every city in America abandoned its rail systems for cars–all that investment and infrastructure just got thrown out the window and I wonder with how much thought? I’ve had the privilege of taking a train into town during a short stint in Washington DC, and found it, for the most part, much more relaxing than driving. Plus, I could get my news reading done going back and forth, leaving my home time for other things. On the other hand, there were those days when it was raining, or the train was packed and hard to get onto, and that was no fun. When you look at the development and evolution of cities over time, it was only after streets like N. State in Jackson, once lined with mansions, turned into highways that the houses started coming down. For some reason, rich people were happy to live on a streetcar line, but not happy about living on a car thoroughfare. You see that in city after city, middle-class and upper-class neighborhoods just going down left and right when the street is switched from a streetcar to a car highway. I wonder if we’re in the process of doing something similar today, regarding abandonment of long-standing infrastructure for the latest thing, with the postal service. It looks like this stereopticon images might have captured one of Jackson’s mule-drawn street cars? I’m sure Dr. Brooks’s research on the trolley system is much more accurate than my childhood memories, but I seem to recall riding on the streetcar in Jackson circa 1939. I would have been four years old at that time.